North Carolina, U.S. - Anti-war vandals struck in the Raleigh-Durham-Chapel Hill Triangle area for the second time in two months. 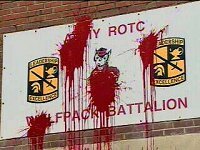 This time, graffiti reading "ROTC trains murderers" and "Resist racist war" was left on two ROTC buildings on the North Carolina State University and University of North Carolina - Chapel Hill campuses. The cost of repairing the damage is likely to exceed $1000.